New Outboard Motor Tilt Tube To Steering Cable Grease Nut @ $17.99 in Aluminum, $27.99 in Stainless Steel - Available for both 7/8" and 1"
Has an o-ring to seal steering cable exit, and a grease fitting to allow for lubrication of the inside of the outboard's tilt tube to steering cable sliding tube. Will not fit 1961 and prior Mercury outboards with 3/4" tilt tube. Utilizes a rod end bearing unit .375" threaded onto a plated steel link arm with plated steel hardware except for stainless steel hex bolt, with rubber tilt tube grommet, and instructions. Utilizes a ball joint with (2) choices of length ball studs, .500" threaded onto a plated steel link arm with plated steel hardware, with instructions. Utilizes a .500" threaded stainless steel rod end with a plated steel link arm which features a 15 degree bend for additional motor cowling clearance, all stainless steel hardware except for the large jam nut, with instructions. Center cover has black coated screw to retain it to the wheel. Factory Painted Bracket with Machine Screws and Nuts bolts to starboard cowl to hold remote control shift cable trunnion lock. No sender is included, a light socket with bulb and retaining bracket & fasteners are included. These have a pleasing appearance we feel well suited to a vintage dashboard. If the outboard or outdrive does not have a built-in pitot tube in the lower unit. Very simple installation because no separate GPS receiver is needed, as the receiver is inside the case. Prevent engine damage by seeing a reduction or loss of water pump pressure with enough advance warning. A temperature gauge will too often will only inform that damage has already occurred. Useful to allow installation in another location, or another boat. Gimbal bracket can be used alone with provided machine screws, fender washers, lock washers, and hex nuts; or in conjunction with base plate to allow the gimbal bracket to swivel (ratchet) for different viewing angles. Useful for installing unit to another location, or another boat. Allows installation of Keller speedometer to dashboard, or for mounting pitot tube to transom. For clip-on installation of Keller speedometers to center of old style Keller aluminum steering wheels. Generally a snap hook is used to connect the pulley to the steering bar. Adapts a "Black" connector transducer to a "Gray" connector depth finder. Allows ignition switch to install in small instrument size dashboard hole. New Old Stock Mercury Quicksilver Large Instrument "Sunshade" Kits @ $24.99 each. For Mercury/Mariner/Sea Ray V6 outboard motors whose on-board 3 gallon oil injection reservoirs have a quick disconnect assembly. This kit includes: a float assembly (which mounts inside the oil reservoir), amber warning light assembly (for dashboard mounting), wiring, fasteners, and instructions. It warns of low oil level in the reservoir indicated by the amber warning light, to prevent depleting the under motor cowling small oil reservoir. There is a horn to warn of this, but it sometimes requires bleeding after refilling. It is much easier to simple replenish the on-board (in boat) oil reservoir before it is completely empty. 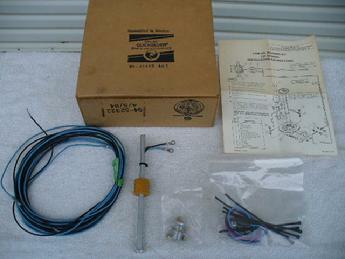 New Old Stock Mercury Remote Control Attaching Kit to fit 1961 Merc 60 (6 horsepower) model @ $79.99. This kit allows a proper remote control box with shift and throttle cables to connect and operate both functions on these normally tiller handle operated outboards. New Old Stock Mercury Remote Control Attaching Kit to fit 1962-1965 Merc 60 (6 horsepower) and Merc 110 (9.8 horsepower) models @ $79.99. New Old Stock Swivel Lock Assembly for attachment of shift cable adjusting barrel to fit Mercury Mark 15 & 20 models @ $5.99. This bolts to the front type steering bar (hoop)(if rear type steering bar, see below) when remote control operation is desired on these normally tiller handle operated outboards. The shift cable end guide is connected with a special pin (@ $3.99) and nut to the stock shift lever. which has the mounting hole needed. shift cable end guide to the shift lever. These can substitute the Mercury KAMINC remote control handles, which had a separate thread-on knob instead of the integral knob. Optional handle intended for use when remote control is port side mounted, or matched with a special starboard handle when twin remote controls are used with twin outboards. Note that many 1958-1959 Mercury Quicksilver Two-Lever Remote Controls utilize a plug-in style choke switch instead. Late style switch which allows starter motor activation with partial depression of remote control handle thumb button, and both starter motor and choke solenoid activation with full depression. Remote Control mounting can be up to 7/8 inch in thickness, or still longer machine screws would be required. Presently available in unpainted, and in Burgundy or Phantom Black factory painted. Will correctly fit 1954-59 4 & 6 cylinder models by enlarging mounting hole in bottom cowl (originally recommended by Mercury), or the possible use of the combination of the smaller diameter bolt and nut (mounting hole size) with flat washers. This style sometimes fits and looks better than modern tilt tube attachment particularly with narrow or "boat tail" transom boats. We also have some alternate mounting brackets for other vintage Mercury models, please inquire. Nice Used Center Cover with Decal for Mercury Quicksilver Ride-Guide Tri-Spoke Steering Wheels @ $29.99. This is an original first-style rack & pinion steering rack assembly with the dashboard bracket type where the steering wheel shaft passes below the bottom edge (of the dashboard) and a matching “Marlin Blue” steering wheel with “sunset” center emblem. To “build” a complete steering system, a Ride-Guide steering cable of the correct length is additional required, as well as a motor connection kit (e.g. : link arm kit, “fore and aft” kit, transom mount kit, thumb washer/clamp bracket mount kit, or splashwell mount kit). We can help with some possible choices of cable length and attaching kits depending on the outboard and the boat in question. Some touch-up to correct some discoloration on parts of the steering wheel rim will be needed for perfection. The Indicator Shaft operates the steering wheel center cover which indicates the outdrive's position. The second picture shows the Indicator style dashboard mount used with this steering system. Aluminum mounting plate (note knock-out area where control mounts) @ $24.99 for use with mounting vintage Morse remote control (such as with Hydrodyne boats). The silver anodizing has tarnished on the front side, but it could be painted, powder-coated, or replated. Spacer (Plate) which installs on each side of the center housing, and between the front and back housings for a twin outboard motor application. Receives two keyed ignition switches, two push-button choke switches, and either a center medallion or ammeter. This has the locating tabs to better retain and position the Medallion in the Start Plate center hole. Nice substitute for modern replacement plastic housing ignition switches which can easily break in time when tightened against a wood or wood reinforced dashboard. 5 terminals allow for use with 2-cylinder magneto ignition. 1958 was the first year usage of a keyed ignition switch for OMC. A red switch boot is used for the starter push-button switch on 1957 and prior models. A black switch boot is used for the choke push-button switch thru the 1960's. At times we have a limited supply of the new old stock boots and switch bezel nuts, please inquire. This could be used several ways, including adding a nice look to an instrument panel/dashboard. "Bilge Pump", "Aerator", & "Lights"
These allow steering cable connection for outboards without a tilt tube, or not utilizing the tilt tube and the boat's deck has a narrow splashwell. On vintage Teleflex or Morse steering cables there was no "gland nut" installed, as is the case for approximately the last 35+ years. These vintage cables had a threaded area which was designed to install into an internally threaded support tube, a component of "transom" style attaching kits at the time. If one of these vintage Teleflex or Morse cables is to be installed "thru the tilt tube" (as most Mercury and modern outboards are connected), a connection and extending kit is required. These kits consist of a short tilt tube extension, knurled coupling sleeve, (2) jam nuts, and a stainless steel, thread-on steering cable sliding tube extender.